This is the first Saigon sketch that I did on my recent trip to Vietnam that I am fairly happy with. It took me about three days to settle in, get used the the hustle and bustle of the place. After a hard morning dodging traffic, breathing in fumes, seeing just a fraction of the unbelievable sights that this mixed up city has to offer, it was always magic to sit down, feet up and have a cool "Bia Saigon". Many times however, knowing that I would sooner or later reach for my sketchbook, I had to delay my choice of venue. As a sketcher I had to choose carefully, with an eye to the view. This place was great, it gave me a safe line of sight straight down De Tham street. (A couple of times in the past I have placed a chair in the street itself to get a good angle of view, "BUT NOT IN SAIGON, BABY". The fact that there was a huge steel power pole with boxes and bird's nest of wires right in front of me might have worried me if I was taking a photograph, but I just chose to ignore it and just indicate it's position in a clear patch of sky. So, the view was good, the food was bland and the service was slack! One outta three ain't bad, eh! Saigon sketch - Looking down De Tham street in Saigon. Slap bang in the middle of the backpacker district of Saigon. 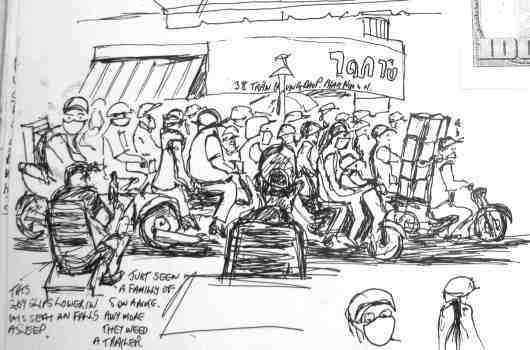 Saigon sketch - The defining feature of HCMC, some of it's three and a half million motor bikes. 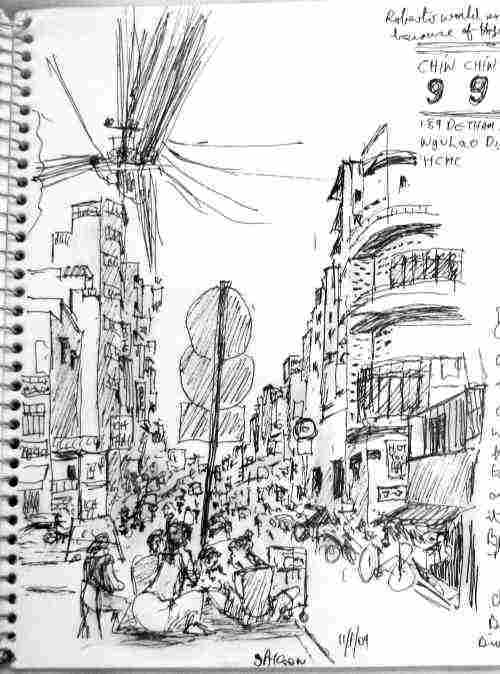 When I was doing this Saigon sketch of a busy street junction I had to turn and look at my neighbour in the cafe, "did you see what I've just seen"?. She nodded smiling "yes there were five of them". I am glad I confirmed it, otherwise I might have thought I had made a mistake, but it was a family of five on a 125cc motorbike! The trick of course here was again position. I was sat opposite a set of traffic lights and just waited for them to turn red and I managed to get maybe half a motorbike drawn for each change. The chap on the left in the chair in front of me was mostly upright when I sketched him in, but by the time I'd finished in spite of the horrendous traffic ten feet from his nose he was at an alarming angle and fast asleep. The joys of cheap beer in the middle of a hot day. In the town of Sa Dec on the Delta I once saw a middle aged lady sat on a motorbike in front of me, get loaded up with eight cartons of beer behind her back on the pillion seat. "But that's not all" they then put one carton in a space in front of her and another on the handlebars. "But wait..there's more". Believe it or not she took off into the traffic without any straps holding it secure! The whole traffic scene in Vietnam is chaotic, and yet it works. It is quicker to get around in HCMC than in Bangkok for instance. Grinling Gibbons Master wood carver.